The may apple is recognized by a variety of popular names, of which the most common are mandrake, umbrella-plant, duck's foot, devil's apple, vegetable calomel, wild or ground lemon. The may apple is a perennial of very striking appearance. 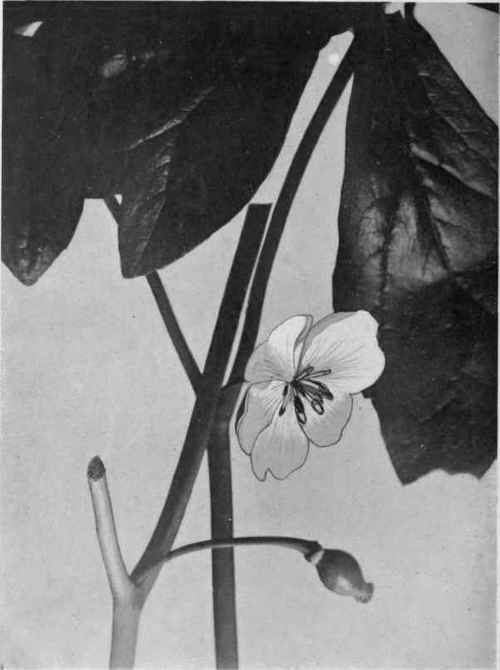 A single stem rises from the underground rootstock to a height of a foot or more, when it forks into two large umbrella-like leaves sheltering a single nodding white flower in their axil. The leaves are dark green, sometimes a foot across, deeply lobed and notched, with the stalk arising from a point within the margin. The wax-like flower somewhat resembles a single white rose. The fruit is about two inches long, green at first gradually turning yellow, lemon-shaped, and claimed to be edible, although ill effects have arisen from the consumption of it in any quantity. The rootstock is greatly elongated, with very long spaces between the scars which remain from each year's upper growth. The scars are large, low, and cup-shaped. The plant is in flower during May. The may apple is a native of Canada, and is found in the woods or on the borders of woods from Quebec to southern Ontario. In some parts of southern Ontario it grows in great abundance. The same bitterness of the blue cohosh is found in the may apple except in the ripe fruit. The ripe fruit or "lemon" is rather pleasant and sweetish, but one is usually sufficient for the ordinary appetite. Schaffner says, "roots, stem, and leaves drastic and poisonous, but the ripe fruit less so. Leaves, when eaten by cows, produce injurious milk. The ripe fruit may be eaten in small quantities." The rootstock contains a resinous substance to which the name podophyllin has been given. Podophyllin is used largely for medicinal purposes, and occasionally fatalities have occurred from over-dosage. In relation to the effect of the root upon the skin, Lloyd writes: "Our employees experience great trouble in working this, owing to the irritating action on the skin. We have in numerous instances had our men cease work for several days owing to its action, which causes very painful inflammation of the skin, especially of the eyes." Millspaugh says in regard to its action on man, the symptoms of disturbance caused by the drug in doses varying from one-quarter to one-half grains of podophyllin and in persons working in the dust of the dried root, are substantially as follows: inflammation of the eyes; soreness and pustulation of the nose; salivation and white-coated tongue; extreme nausea, followed by vomiting; severe pains in the transverse colon and abdomen, followed by an urgent call to stool; thin, offensive, copious stools; weak pulse, prostration, drowsiness, and cold extremities.